On our first morning in the Sesriem area we headed into town — "town" consisting of exactly a gas station — to get the punctured tire patched. I was interested to know what had happened to it so that I might adjust my driving habits. Nail? Maybe I should drive out of the main tracks a bit more. Or had we punctured a sidewall on a rock at the road's edge? Maybe I should pay more attention to the road and less to the scenery, or my icy coffee drink, or the map... You know. Turn's out it was a rock, but wasn't in the sidewall. Smack dab in the middle of the tread. The rocks are sufficiently sharp in Namibia you can actually puncture a 4x4 tire... just driving. It left a clean cut an inch and a half wide. Not much you can do about that, I guess. The Sossus Oasis Filling Station in Sesriem. Given the rugged distances we'd traveled to get there, and the fact that it was totally deserted when we arrived, we were a bit shocked at the appearance of three or four dozen very pale folks. I mean, seriously... Who are you people? How did you... ? What the heck?? We'd driven 100 km past the town of Solitaire on the way in the previous evening, … Solitaire, … only to run into this?! Doesn't that violate some cosmic law of irony or something? Elim Dunes area of Namib Naukloft Park. We needn't have worried. 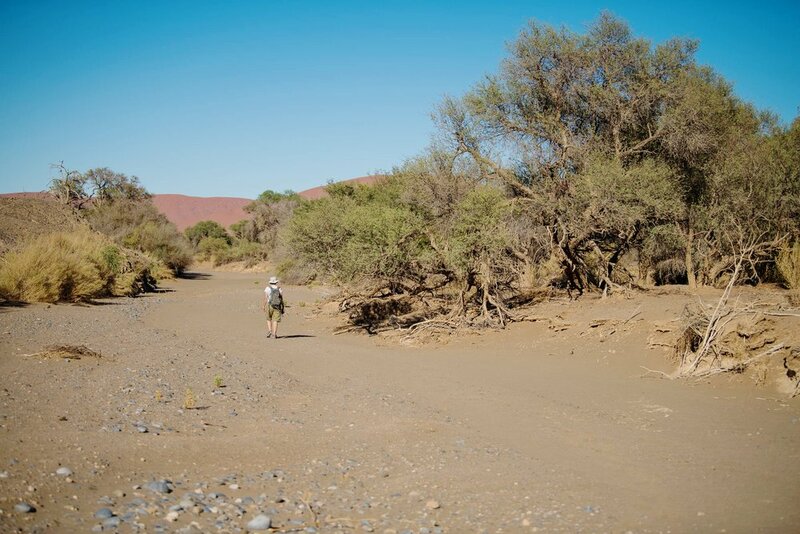 There's more than enough space in the Namib to swallow up, well, ... just about anything. That's Donna in the image above walking toward our vehicle. In fact, there's only a single ribbon of tarmac within this entire section of the park. 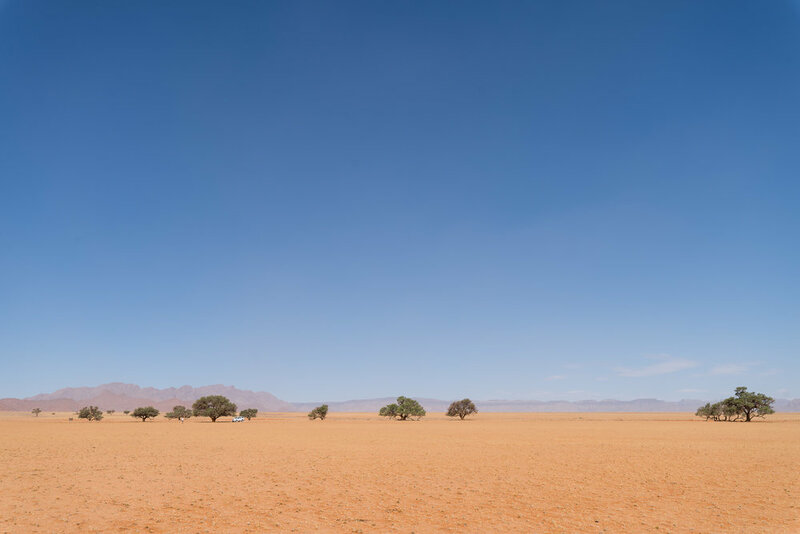 It runs 65km due west from the entrance at Sesriem out to Sossusvlei. Were you to head off perpendicular to that thin black line, walking north or south, you wouldn't hit anything but dunes for 100 - 200 km. Literally, nothing but piles of sand. To the west? It's another 60 km to where those same dunes drop straight into the cold Atlantic. Somehow this image has a bit of a cool feeling to it. For the record, I burned my knee getting this shot. The air temperature was 100+ degrees. Who knows what temperature the black asphalt had gotten up to. The question we asked ourselves over and over again was, how does something this big survive out here? What does it eat? Where does it find enough water? Ditto for zebra. And ostriches, too, for that matter. While it may seem a bit underwhelming for a riparian pocket, the amount of plant and animal life supported by this dusty riverbed was amazing. We got up very early one morning to hit the park gate at 6:00a so that we could hike a ways along this dusty riparian corridor just after sunrise. It didn't disappoint. In fact, we were constantly amazed at the number, and size, of the animals that managed to carve an existence out of this unforgiving terrain. On the drive in we'd seen Oryx, Zebra, and Ostrich. 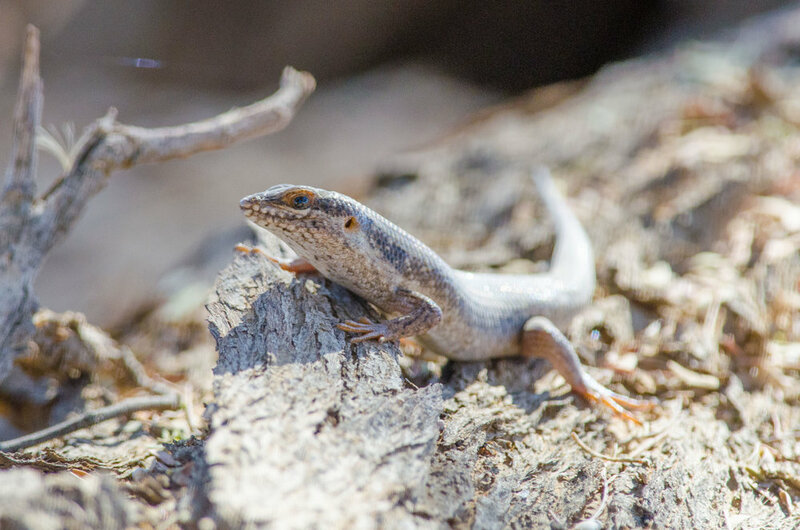 On our short hike up the dry bed of the Tsauchab River, probably not more than a half mile or so, we saw, lizards, doves, sunbirds, weaverbirds, multiple canary species, bee-eaters, a scimitar bird, and the tracks of a carnivore big enough that we were really hoping we didn't actually see it. Actually, I was really hoping we didn't see it. Donna, as usual, was completely unfazed. ... as he diligently worked on his nest. Every once in a while a female would fly up and alight on the horizontal branch overlooking the nest and watch his progress. Each new blade of grass he brought back he would diligently weave into the existing strands. He'd then climb up into the nest and press his wings up against the ceiling to ensure that the shape remained perfect. There were other interesting finds along the dusty banks of the Tsauchab River, as well. Including something big enough to make the hair stand up a bit on the back of my neck: hyena, leopard, cheetah? Donna will have to weigh in on that identification. The weaverbirds were particularly interesting. There were a couple of different males working diligently on nests above the riverbank. The male builds the nest alone hoping to attract a female to it. Incredibly, they do this not once, but many, many times each year. A single male can build thirty or forty nests a season! And, at least with Southern Masked Weavers, the males actually destroy their own nests. In fact, they sound a bit like tortured artists, often going on destructive rampages, sometimes destroying multiple nests they had just built. The article linked to above notes "Nest-destruction ... often culminated in a period of great exuberance and vocalization." For the record, each nest is built with a single blade of grass at a time and, if I recall correctly, a typical nest contains something like 700-1,000 blades of grass. That's a thousand trips back and forth for one nest. And it usually takes him about 10 minutes to destroy it. 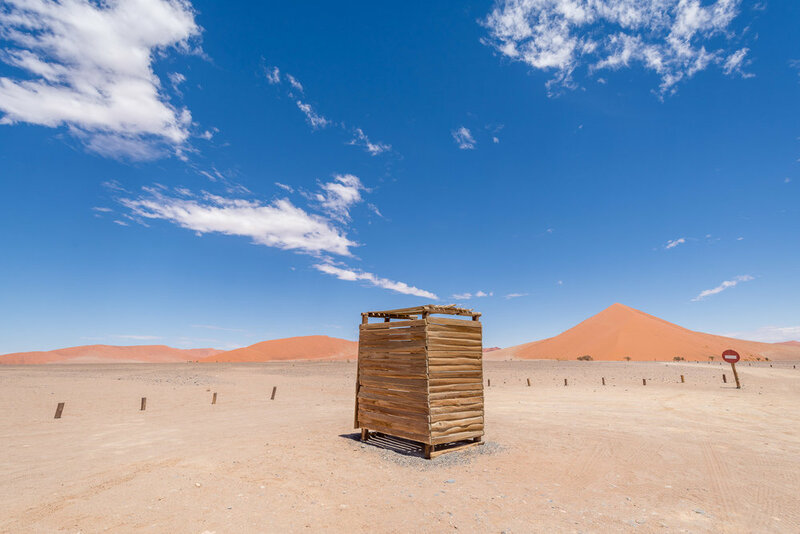 Of course, the star attraction at Namib Naukloft are the dunes — well, that and Deadvlei, but the latter deserves a separate post of its own. In regard to the dunes, it's a bit difficult to do justice to the scale of the place. That little sandhill behind the tree below? About three hundred feet tall. Some of the dunes within the park reach to over a thousand. Dune 45, Namib Naukloft Park. Dune 45. Namib Naukloft Park. 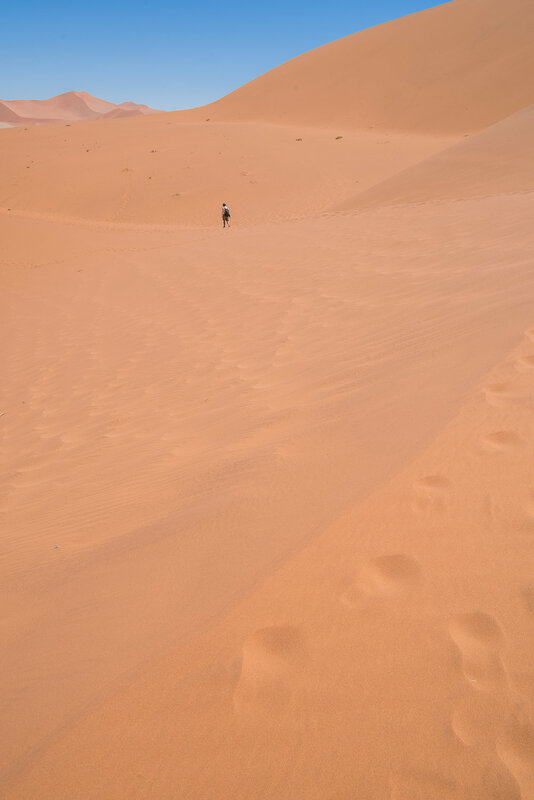 Donna hiking near Big Daddy Dune. The image on the right above, or the one below, might provide a little better indication as to the relative immensity of the place. Pay attention. This is NOT the kind of place you want to get lost. 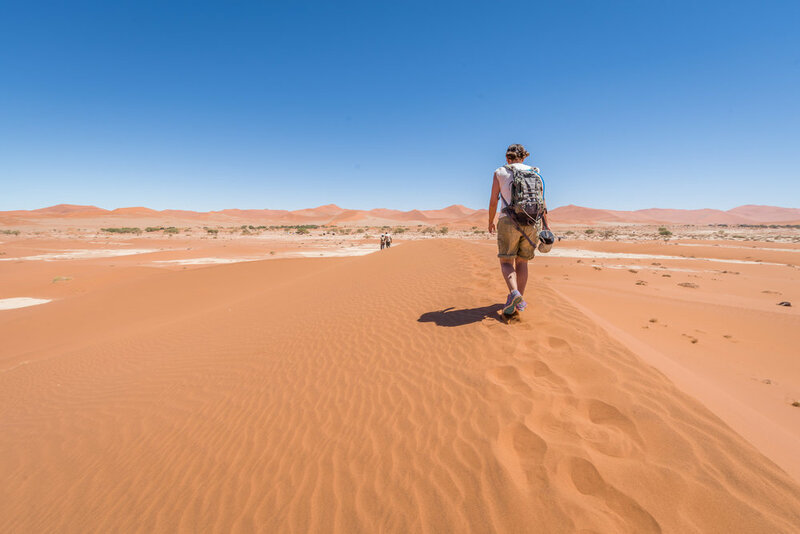 Hiking the dunes at Sossusvlei, the end of the road. In our experience, the best thing you can do once it hits midday is slink back to the Restaurant/Bar near the entrance, one of the few places in Namibia we were able to find fresh, cold salads. Can be an interesting place to do a little people watching as well. One of the very kind park staff who showed us a Sociable Weaver bird nest and pointed us off toward a potential spot to see Secretary Birds. There's a community of weaverbirds in the tree just outside the restaurant as well. In this case, however, they're Sociable Weavers. Sociable Weavers build communal nests that can have 300 chambers. Here we're looking up at one from directly below. It's about 8 feet across and a dozen feet long! Once the sun starts to sink a bit you can head over to the Elim Dunes area of the park, just a few kilometers from the entrance. One of the animals we desperately wanted to see on the trip was the Secretary Bird. One of the park staff suggested the grassy area just this side of Elim Dunes. While we didn't see any Secretary Birds there, it's a beautiful area. And we did see Oryx, Wildebeest, and a Ludwig's Bustard. 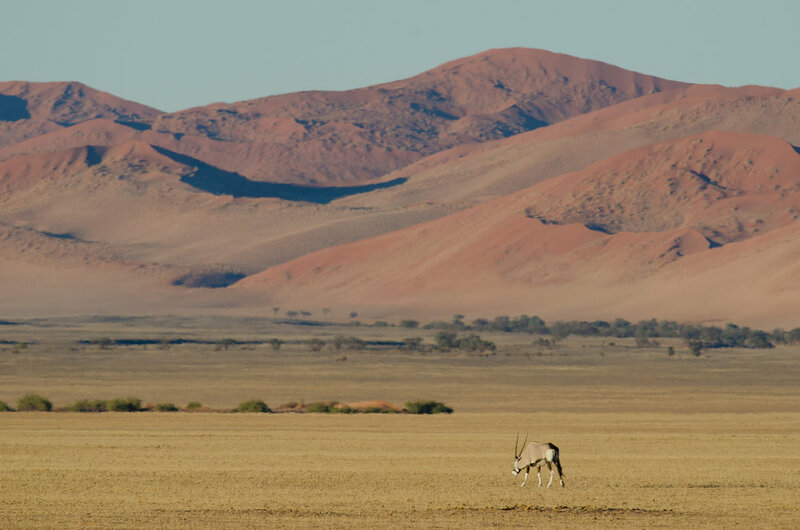 An Oryx grazes beneath Elim Dunes. A Wildebeest crosses beneath distant mountains. Clearly we aren't the only ones who think it a beautiful place to rest in the shade. An Oryx trail leads to a lone tree. ... hugged a tree today? Let them know they're appreciated!